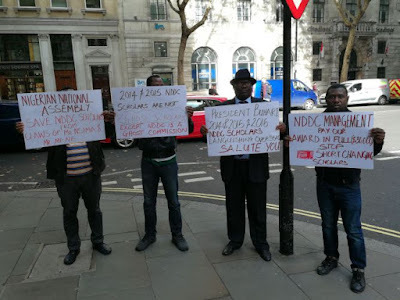 Some beneficiaries of a scholarship scheme put in place by the Nigerian government through the Niger Delta Development Commission, NDDC, on Thursday protested at the Nigeria House in London over non-payment of allowances. The protesters, who are running doctorate programmes at different universities in the UK, said they have been abandoned by the Nigerian government. Premium Times reported how the 2014/2015 beneficiaries of the scholarship – for Masters and PhD programmes – had lamented the NDDC’s insensitivity to their plight abroad. “Our protest is against the criminal neglect and abandonment by the current management of the NDDC led by Messrs. Ndoma-Egba and Nsima Ekere,” one of the protesters told Premium Times over the phone on Thursday.